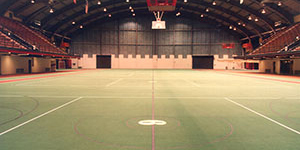 Horton Field House opened as the first major building in West Campus in 1963 and was named after Dr. Clifford Pops Horton, director of the men’s Health and Physical Education Department at Illinois State for 33 years. Dr. Horton served at the University from 1923-1961. The Horton Pool is located at the west end of the Horton complex and was built for speed. The six-lane pool is where 23 of the 24 Illinois State school swimming records have been set. Through the years, Redbird swimmers have claimed six Midwest Independent titles, three National Independent championships and six conference titles while training at their convenient home. Still considered a ‘fast pool,’ the facility also includes a dry board inside and outside the pool for training, a trampoline, a hot tub for relaxing sore muscles, and inspiring Redbird Spirit decor painted on the walls.